The Commonwealth of Dominica is located between the French islands of Guadeloupe and Martinique. Dominica is an English speaking country frequently confused with the Dominican Republic. The Commonwealth of Dominica or Dominica and the Dominican Republic are two distinct countries. While Dominica main language is English that of the Dominican Republic is Spanish. Dominica is very small when compared to the Dominican Republic. Dominica is a mere 289 square miles in size where as the Dominican Republic measure up to approximately 18 000 square miles which makes it the second largest country in the Greater Antilles. The Dominican Republic is located in the Northern end of the chain of islands which make up the Caribbean whilst Dominica is located in the centre of the chain of islands. Dominica has become well known for its second passport program which aims to attract foreign direct investment to the island. This has had many benefits for the island and investors who after having satisfied requirements and invested qualify to apply for citizenship. The application process is a rigorous one but the support of a licensed agent is guaranteed to ensure that investors submit the correct documents and in the format required. For example, passport copies for identification must be notarized along with other documents. Professional and character references must be originals and if written in a foreign language must be translated by a certified translator. Licensed agents are designated by the government and are required to operate compliant with regulations targeted at agents, among others. Second citizenship in St. Kitts can be applied for in a similar manner whereby applicants are required to invest in real estate or the sugar diversification project and thereby qualify to apply for St. Kitts citizenship. Second citizenship presents many advantages, include greater visa free travel to many countries, lower tax rates, friendlier business environments and access to more foreign markets. It is never too late to seek legitimate ways of tax minimization. Investors are able to set up corporations offshore for privacy and to enjoy a series of tax free benefits. Dominica has two airports which accommodates travelers to and from the country. The airports are the Melville Hall airport which commenced its services to the public in 1961 and the Canefield airport which opened in 1982. Melville Hall airport the bigger of the two has direct flights to and from San Juan, Puerto Rico, Antigua, Barbados, St. Lucia, Martinique, Guadeloupe and St. Maarten. Air Cargo services are also provided at Dominica airports. There are flights to and from the Canefield airport to the following Caribbean countries; St. Maarten, St.Lucia, Martinique, Guadeloupe, Antigua and St Thomas. International Air Transport Association (IATA) airport code for Melville Hall airport is DOM and the International Civil Aviation Organization (ICAO) airport code is TDPD. The International Air Transport Association (IATA) airport code for the Canefield airport is DCF and the International Civil Aviation Organization (ICAO) airport code is TDCF. Upon arrival in Dominica make it a d ate to visit Best Restaurant in Roseau, the capital. Fusion Village Restaurant prices are great, making it possible for guests to have a wonderful time out. Prosciutto is deliciously prepared and is a favorite on the menu. The Melville Hall airport is located on the north east coast of the island a few minutes outside the community of Marigot. 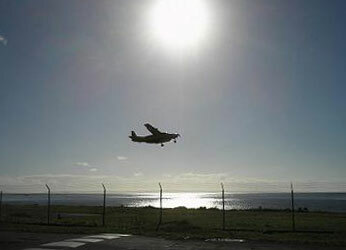 With an airstrip of 4900 feet long the airport accommodates bigger planes than the island’s other gateway. Airlines which services the airport includes; LIAT, American Eagle, Air Caraibe and Carib Aviation. Air cargo services are provided by companies such as Amerijet. The airport is situated approximately 38 miles away from the town of Roseau. To get from Melville Hall to Roseau or any part of Dominica there is taxi service, car rental services available at the airport. The ride to the capital is approximately one and a half hours and cost just about EC$150 per taxi. Car rental services are available at the airport most arrange airport pick up and drop offs. Other services provided include public car park. Available at the airport is a souvenir shop, duty free shop and a restaurant. The Canefield airport is located about three miles, fifteen minutes outside of the capital, Roseau in the community of Canefield. The smaller of the two Dominican airports Canefield can only be service by small aircrafts of up to 19 seats. Airlines which operate from Canefield include; Carib Aviation, CK Airline, Air One Ltd, Bevin’s Air services, Winair airline, and private airplane are also available for charter. Cargo services are provided by Bevin’s air services and Air One Ltd. To get to Roseau or anywhere in Dominica from the Canefield airport there are taxies, car rental services and public transport can also be used. Taxies from Canefield to Roseau costs EC$50 per taxi. The airport is located near a bus stand and the bus ride to town costs EC$2 per person. The airport has a free car park, souvenir shop, Automatic Teller machine for doing banking and restaurant. Although there are no international airports or night landing in Dominica airports, getting to the island getting here is relatively easy. Persons coming to the island from Canada, United States or Europe can get a connecting flight from any Caribbean country into Dominica. A departure tax of EC$55 applicable to persons 12 years of age and older is charged at the airport. The tax is only payable in cash.